That is British humor at his best. The Goodwood Festival of Speed ​​is a very serious event, but with tens of thousands of car buffs at the same place, it’s also a great opportunity to do some crazy stuff, and this is what Nissan did. Actually, they had tried to do it last year, but the organizers refused. This year, they agreed. You have to be mad. They agreed that a car will perform in reverse! 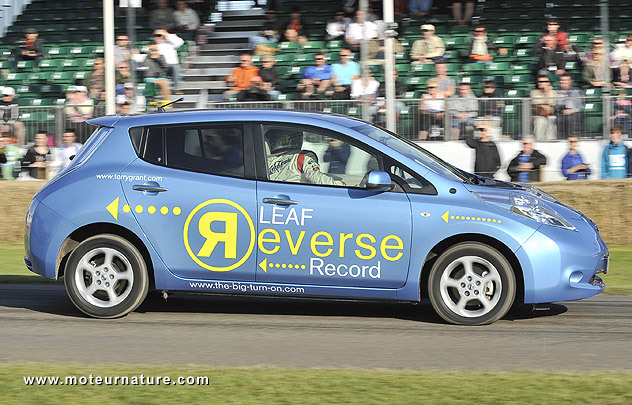 The driver was Terry Grant, an experienced driver and stuntuman who last year was in Goodwood to drive a Nissan Juke on two wheels! He had 2 wheels in the air for the whole length of the track, and he did it in reverse this year. Not an easy task, it’s not a straight! There are turns, and making a high speed turn in reverse takes a really skilled driver! On most cars, it would not be much of an issue because of short gearing, but the car here was an electric Nissan Leaf. It doesn’t have a gear for reverse, it has a motor which revs the other way to drive backwards. Theoretically, it can go as fast either way, but cars are sold with an electronic governor which limits them. At Goodwood, that governor was removed. Terry Grant drove a mile (1609 meters) in 1 minute 37:02 seconds. Average speed was 55 mph. Kids, don’t try to do outdo him!